This review first appeared on Oct. 28, 2016 at AllAboutJazz.com. 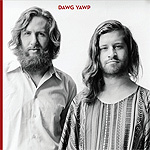 Drawing equally upon threads common to Mumford & Sons, late period Beatles, acid-blues pioneer Little Axe, world music-era Paul Simon, and the good Lord only knows what else, the Cincinnati duo of Dawg Yawp has produced one of those little gems of an album that not only defies easy categorization  but even so much as adequate description. It is, perhaps, music that could only find a niche in a post-retail world  because the staff at Tower or Peaches Records would have spent days trying to figure out which section to put this in. Structurally the music is primarily blues and folk  but with broad swaths of psychedelia, Indian classical and country thrown in. Philosophically, it probably hews closest to Peter Gabriel or the Beatles in its coupling of all-encompassing curiosity with pure melodic beauty. And the soaring vocal harmonies recall early ’70s folk duos like Seals & Crofts or Batdorf & Rodney. Tyler Randall (sitar, vocals, drums, keyboards) and Rob Keenan (guitar, vocals, keyboards) seem wholly uninterested in creating music that can fit into any existing radio format. They borrow freely from anyone and anything  and then blend it together into something so immediately accessible and seamless it seems remarkable that nobody ever thought to create this particular strain of music before. “East Virginia Blues” is a startlingly gorgeous mashup that manages to simultaneously encapsulate both bluegrass and Piedmont-style blues. There are the beautiful vocal harmonies a la Sonny Terry and Brownie McGhee or Cephas & Wiggins, with the fingerpicking structure of bluegrass  all of it anchored by Randall’s sitar lead, making it familiar yet new. The opening track, “Maybe,” along with “Lost at Sea,” “Not So Sure” and “Can’t Think” feature heavy doses of synth tech that call to mind Skip McDonald’s “Little Axe” persona that remixed Son House and Howlin’ Wolf into something the hip-hop generation could feel comfortable with, while never losing touch with their deep blues. Dawg Yawp has a similarly deft touch at updating folk and blues while keeping that core intact. “I Wanna Be a Dawg” is the sort of song Steve Winwood used to excel at  taking a traditional structure, wrapping a seductive theme around it, adding some modern flourishes, all the while keeping it solidly in the blues. Good luck getting that chorus out of your head. The album closes as strongly as it opens with “I’ll Quit Tomorrow,” a bright folk duet that would have fit comfortably on an early Simon & Garfunkel or Cecilio & Kapono LP. Lovely harmonies, memorable theme, virtuosic playing. Every song is a self-contained gem; the run of them makes this album a fully realized instant classic.